Is Guardian Protection Services still relevant in 2018? Find out more about how customers feel about Guardian Home Security in our customer Guardian Security Reviews section. Want to know what customers think about their Guardian Home Security Systems, check out the Guardian Alarm Reviews. If you already are a customer of Guardian Protection Services, take a minute to share your experience in our section for Guardian Security Reviews. Despite having changed hands a few times over the years, Guardian Protection Services still maintains an A+ BBB rating. However, their rather limited service area combined with somewhat inconsistent dealer performance and the prospect of a 5-year monitoring agreement means that one should carefully scrutinize the contract and investigate the local dealer before making a decision. Online Guardian Security Reviews reveal many concerns with the length of the contract and early termination fees. Guardian Protection Services – How do they compare? Our Guardian Protection Services review summary and detailed editor’s reviews are followed by the customer Guardian Reviews and a FAQ section in which we compare Guardian Home Security with some of our top rated alarm companies. If you currently have a Guardian Home Security system, we hope you will share your experience with our readers below. Potential Guardian Security customer or current Guardian Protection Services client? Considering securing your family utilizing Guardian Protection home alarm system? Existing customer looking for better alternatives to the Guardian Protection program? The Home Security Advisor was developed to be a extensive reference to assist you in finding the best security solutions and make informed decisions about home security …along with providing valuable tips on how to look after your property and family. To assist you in quickly locating information on the Guardian Alarm System , along with some of the other most sought-after security alarm service providers,we have included a useful table of contents, with “quick jump” hyperlinks that may help you navigate straight to the particular areas that interest you most. Professionally installed security solution by experienced and well regarded security company. See how Guardian compares with the competition! Headquartered in Warrendale, PA, Guardian Protection Services was founded as Guardian Alarm Services of Pittsburgh, Inc. in 1950. It was later purchased by Russell Cersosimo in 1975, when the name was changed…and ultimately acquired in 1991 by the Armstrong Group of Companies. The largest privately held security company, Guardian Security has grown to become the #10 ranked home security company on the SDM Top 100, and currently protects about 300,000 homes, families and businesses They enjoy an A+ BBB rating and were awarded the prestigious SDM Dealer of the Year award in both 1999 and 2013. Guardian operates their own UL Listed, Five Diamond Certified monitoring station. They offer 24/7 protection against intrusion, medical and personal safety, fire and environmental hazards and offer Crash and Smash Protection, severe weather alerts and 2-way voice monitoring on select monitoring packages. A full range of monitoring services is offered by Guardian- from basic home security over a landline to fully integrated energy management and home automation packages. Monitoring rates run from $29.99-$54.99+. While basic package prices are fairly competitive with other national companies, add-ons can get pricey. Pricing is often dictated by the local authorized dealer, so there can be significant differences between price quotations. Most equipment (excluding door locks and video cameras) carries a lifetime warranty at no additional charge on essential packages and up. Customer experience is generally positive, and Guardian maintains an outstanding A+ BBB rating. However, a casual search of customer feedback on Yelp, review sites and forums reveal a significant number of customer complaints involving sale misrepresentations, 5 year contracts and auto renewal clauses. While there is No Return Policy, Guardian does offer a 6 Month Service Guarantee which stipulates that they will resolve any service related issue within 6 months. Guardian Protection Service offers a quality alternative to one seeking a nationally recognized brand offering a professionally installed system. However, their company installed and serviced areas are limited TX, NC, MD, IL, OH, IN, FL, PA, and WI. While Guardian certifies the individual dealers to help ensure a quality customer experience, the service experience may vary significantly depending on the caliber of the independent dealer in your area. It would appear that there may be issues with misrepresentation by some less scrupulous dealers…some of whom may be requiring 5 year contracts with auto renewal provisions. Make sure that you scrutinize contacts carefully, before signing on the dotted line. We recommend that you research the local dealer carefully, and explore our top alarm companies before making any long term commitment. Guardian Security is an authorized GE/Interlogix dealer and offers the latest line up of Interlogix products. Guardian Security Systems are professionally installed by either Guardian Security or an authorized Guardian Security Services dealer. How does Guardian Home Security stand up to the competition? If you reside in one of the states serviced by Guardian and are looking for a professionally installed alternative to an ADT, Monitronics or Vivint security system, they are a good option. You can see where they stand on our Top 5 Rated Alarm Companies or in the side by side comparison summaries, below. Check onlline Guardian Security reviews …and then check and see what ADT can do for you…. Fronpoint Security has a reputation for having the best customer service. After evaluating Guardian Security reviews, contact the folks at Frontpoint and see how Guardian Home Security stands up against Frontpoint Security. Before getting a Guardian Alarm system, you might want to see what Protect America is the #1 DIY alarm system in the market. Don’y worry, they pre-program the system before they ship it…so all you have to do is place the sensors and call in to activate. Monitoring Rates from $19.99 /mo. So…do yourself a favor and compare Protect America and Guardian Security side by side before you decide…. You might not have heard of Link Home Security, but when you compare their online reviews with Guardian Security reviews, you will want to take a closer look. See how Guradian Home Security stacks up…. Armorax DIY or Guardian Protection Services Professional Install? Guardian Home Security Systems are professionally installed. However, the majority of the systems are wireless which raise the question of whether or not professional installation is required at all. There was a time when home security systems were all hard-wired. This required professional installation . Security systems used to be complicated and require drilling holes, fishing wires and programming systems. Today, there have been many advancements in modern wireless technologies that have resulted in simplifying and streamlining the entire alarm installation process. Reputable DIY Alarm Companies like Armorax pre-program, customize and configure the entire system before shipping it out…so installation is a snap. Basically installation is little more than placing a few sensors and calling in to activate the system. A lot of our preliminary excitement with regard to Armorax has now slipped away significantly because the enterprise continues to demonstrate signs that it’s struggling. The BBB standing has fallen off significantly coming from an A (during the time of our initial Guardian Security review) to a C+. Throughout our secret shopping efforts, we have realized that even the sales department fails to pick up calls. Incoming enquiries are greeted using a voice mail which unfortunately advises them to contact 911 should this be an emergency…or to stay on the line for the product sales representative. After 2 or 3 minutes or so on hold, one is ultimately greeted by an answering service who is going to demand a name and telephone number for a return call. On top of that, Armorax has already switched providers 3 times over the past twelve months. They have switched from the state of the art 2 Gig lineup, temporarily advertised the Interlogix Simon XT, and are now offering the lesser known Resolution Helix control panel. They have also dramatically changed their monitoring price plan three times in the last twelve months. With regard to online Armorax reviews, you will see that no two sites share the identical costs. Armorax initially made available no contract programs and programs together with Free equipment and monitoring rates as little as $19.99/mo. Their next offer was $24.99/mo. for security and full home automation. This was a great value for money, when our initial reviews and evaluations with Guardian were performed …but, is no longer available. Their active promotion is priced at $99.00 up front combined with standard monitoring starts at $34.99 and the Mobile APP is extra! In addition, the complete lack of online transparency does nothing to inspire confidence. At the moment they have a a single page website that features little information regarding the firm qualifications, hardware, pricing, monitoring provider as well as services, Mobile App, Unit installation instructions or training videos …or nearly anything otherwise which a potential customer might choose to find out. Although the company showed excellent promise initially, we are now no longer keen with regards to them as a dependable alternative to Guardian Proteion Services. . In our assessment, there are superior alternatives. Below is the original comparison. It is for comparison only…as much of the material has changed. Armorax has a superior A BBB rating. They are fully accredited with the BBB , and have complied an impressive 88% positive reviews on the BBB reviews page. This translates to a 4.67 out of 5 stars! With Guardian Protection Services , you will be required to pay $99.00 up front for installation. Add-ons with the Guardian Security System can get pretty expensive. There is little transparency on the site, but professionally installed sensors typically cost about twice as much as their DIY counterparts. This can result in driving the costs up hundreds or even thousands of dollars. Guardian monitoring rates range from $29.99 to $54.99+, and require contracts up to 60 Months. The lowest monthly rate is for bare bone landline monitoring. And who knows what the future holds….Their contract contains an escalation provision which enable them to raise the rates after the first year. In addition to the $99.00 installation fees, Guardian Security monitoring rates can run up to $54.99+. Guardian Security Systems require an upfront installation fee, and charge higher monitoring rates for packages that require additional services. Ultimately costing more than twice as much per month on more comprehensive packages. Guardian Protection Services offers a full portfolio of security and home automation services t…but, only in their top tier plans- that run up to $54.99+. Comparable Guardian Security service would cost at least an extra $100 up front…and DOUBLE the monitoring rate. After reading up on Guardian Alarm reviews….give Armorax a call and take their 30 day challenge! Why should I choose a Guardian Home Security System? Guardian Protection services has been professionally installing systems for over 60 years and are a good,local alternative to Monitronics or Vivint, if you require professional installation. They are ranked 10th in the country by the Security Dealers Magazine and have and A+ BBB rating. Can renters get Guardian Protection? Does Guardian Security install systems for renters? If you are renting a home,condo or apartment, you will need to call to inquire if Guardian Security Systems are available for renters in your area. Most professionally installed systems are available only to homeowners, but many companies will make exceptions in certian circumstances. In any event, if you are approved, you will have to furnish documentation of landlord consent, as well as furnish them with codes and passwords if they need to gain entry in an emergency. 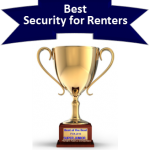 For anyone who is renting, you can check out our post on apartment security and the best security systems for renters. Is a landline necessary to monitor Guardian Home Security? A Guardian Home Security system doesn’t require a landline for monitoring. In actuality, cellular service is the best method of monitoring for Guardian Home security systems. This eliminates the possibility of an intruder cutting the phone lines. While some Guardian security reviews might complain about the additional expense of a cellular connection, many homes are defraying Guardian security prices by foregoing the landline completely. Do I need a permit to install Guardian Security? Is it essential to secure an burglar alarm permit to install Guardian Security Systems? Strictly speaking, you won’t need a permit if the system is not going to be professionally monitored. On the other hand, since the home Guardian security system is going to be remotely watched with the objective of employing emergency response assistance, lots of local cities need to have a permit. Most often, this calls for simple registration in conjunction with your hometown law enforcement or sheriff’s department along with some sort of nominal payment. You will more than likely be also required to produce the company name, address and phone number of Guardian Protection Services, as well as monitoring station, should the two organisations end up being different. Wherever permits are required, virtually all municipalities will demand some sort of one time service fee to enroll an individual’s alarm system, even though areas need to have a yearly renewal too. In municipalities with higher burglary as well as false alarm rates, failing to register can cause a refusal to respond to places that lack a security alarm permit…although this is certainly somewhat exceptional. having said that, you might be responsible for greater penalties and fees if police, fire or perhaps emergency medical support are dispatched to a home without a permit present in towns where one is mandated. Even though a permit is normally procured, nearly all cities could very well assess penalties when it comes to numerous false alarms. Just about all cities now have procedures established where the initial 1 or 2 dispatches do not demand penalties. Subsequent to which fees in most cases increase from $25-50 to your initial enforceable offense…to $100-200 for consequent repeat infractions. Therefore, it is important that all home security system customers communicate with his / her local police department, find what permits are needed, acquire a complete knowledge of the neighborhood rules and make sure they take into account the required steps in avoiding false alarms. It should be noted that Guardian Protection Services doesn’t charge for false alarms. However, as mentioned previously, false alarms caused cause by your Guardian Home Security system may end up becoming more than just a hassle, as they can ultimately create an additional strain on your neighborhood law enforcement resources. This can wind up generating steep fees and penalties. Most Guardian Security reviews don’t mention it, but the vast majority of calls are a result of false alarms, For that reason, most municipalities enforce penalties and fees to homes when they go beyond a specific number of false alarms. To prevent this, the following are some strategies to protect against the prospect of false alarms with your Guardian Security system. • Ensure that everybody knows how to disarm the alarm system. Your Guardian home alarm has a master passcode, as well as a number of additional individual codes that may be programmed into the system. Try to make certain everyone knows his or her code along with learns how to disarm the burglar alarm. • Be sure that that everyone also knows the password. If there is an alarm, the central monitoring station will generally contact your house initially and request the security password. If the person replying to the call is unable to give you the proper password, the authorities will likely be dispatched. • Be certain that windows and doors are properly secured before arming the system. While you are off at work, an entrance that has been left somewhat ajar could very well be blown open. • Make sure that all sensors are mounted securely and in the correct places. Motion detectors have to be mounted at a height of 6’ and also clear of fans, heating units, fireplace and air conditioning units. • Take into consideration things which might possibly trigger a motion detector.In addition to pets, AC units could potentially cause fluttering draperies or plants and even helium balloons that may be transported within the your home by way of air currents. Make sure they are tied down away from the motions. • In a perfect world, your pets really should be restricted to areas clear of motion detectors. If that isn’t quite possible, Guardian Security has “pet friendly” or “pet immune” detectors which commonly screen out smaller pets under 40, 50 even 80 lbs. Guardian Protection technicians can also configure motions to create pet alleys in which pets could move freely about. Another option is to use glass break detectors as an alternative to motion sensors. • Don’t forget to swap batteries when required.Guardian Security uses Lio-Ion batteries which actually have at the bare minimum a two year estimated life expectancy. in addition to warnings on the panel, Guardian Protection Services monitoring personnel will typically contact you to let you know that they are receiving a low battery signal. It is advisable to obtain additional batteries and keep them handy so you can remove and replace them without delay. Your system may also notify you if there are just about every other problems with sensors. In the event that you receive system error warning, perform a status check and check out the sensor. Contact Guardian Protection Services if it appears to be malfunctioning. Store customer Guradian Security manuals/codes/passwords in a very reliable spot where they could be checked as appropriate. Keep in mind, the best way to avert false alarms is to use your system on a consistent basis and be sure everyone is familiar with how to operate the system. Will my insurance rates go down with Guardian Security? In most cases, yes. As a matter of fact a Guardian Home Security system may help reduce losses in a break in. According to the FBI , in 2012 the typical loss in a residential break in was in fact over $2,200. Although having Guardian Security does not guarantee that a building won’t end up being broken into…losses will likely be significantly reduced when Guardian Protection Services is monitoring the home. Guardian Security reviews claim lower insurance costs. Insurance carriers often make available substantial discounts on homeowner’s insurance when the property is safeguarded by a monitored Guardian home security system. Although savings range between company to company, common discounted rates range between 5-20% based on the type of security system along with the level of services which are provided. Some Guardian Alarm reviews claim that they had to provide proof of installation,so confirm that the insurer knows whether or not the system is supervised and whether things like fire, flood and freeze protection is integrated in your security system. Guardian Security usually supplies a certificate of installation describing the kinds of services for which your system is monitored. Will Guardian Protection Services help lower my insurance rates? Is Guardian Security available nationwide? Keep in mind that Guardian Security systems will be hard to get in a number of regions. This is often pointed out in unenthusiastic Guardian Security reviews. Guardian Alarm system customers have become upset whenever they exchange and still have issues canceling their contracts. Guardian Protection Services are unavailable in quite a few locations. When selecting a burglar alarm supplier to help protect your family members , we suggest searching out the most reliable nationwide security alarm provider which is going to be in a position to help secure your home throughout the entire country. Guardian Security is more of a regional provider. No body wants to be obligated to a long term contract if they move to an area where Guardian Protection services are not available…and then end up having to fight with them to get out of the contract. Before signing a long term contract with Guardian Security, you may want to check out some alternatives in our top rated nationwide security system providers. If you already have an Guardian Security system, please share your experience and rate them in our Guardian Security Reviews. Guardian Home Security -Lets you choose how much protection. OFF – Even when your Guardian Alarm system is turned off, certain functions are still active. your Guardian Home Security system will still alert you if a door or window is opened if the chime function is active. Also, life and environmental safety systems (i.e. water or low temperature) are still active. This is important because if a fire breaks out or there are excessive carbon monoxide emissions present, your system will still alert the Guardian Protection Services central monitoring station. Stay– You can arm just the doors and windows by arming your Guardian Alarm system in the “stay” mode. Away– The Guardian Home Protection away mode will activate any interior motion detectors as well as the doors and windows. Instant – You can eliminate the entry delay on your Guardian Home security system by arming it in instant mode. Duress – You can even set up a special duress code that will notify the Guardian Protection monitoring center that there is a potential hostage situation. This service is optional and will not increase the Guardian security prices. If you are already a Guardian home security customer, please feel free to share your experiences in our section for Guardian Security reviews. Your Guardian alarm reviews are important feedback for customers considering a Guardian alarm system. Often times Guardian Protection Services reviews from actual customers carry more weight than company sales materials. There are various of important questions you need to determine before buying a system from Guardian Protection Services, or any other program. Since you are most likely getting a 3 to 5 year legally binding contract, it is important to think about a variety of details before you sign the contract. Irrespective of whether anyone from Guardian Home Security came knocking on your door, called you on the phone or you might be responding to another shiny full-page color promotion for a Guardian Alarm System ….it is very important make certain you possess a full knowledge of the many available choices to you to help make the very best choice possible. Do it yourself as opposed to Guardian Alarm Expert Installation? One of the primary considerations is whether you wish to install the unit on your own or possibly provide for an expert installation. Traditionally, systems would have to be hard wired into the your home. This certainly will require drilling and cutting holes through the walls, fishing wiring and complicated mounting and extensive encoding. Then again…times have changed. In fact the majority of Guardian Security systems are wireless. The equipment isamazingly simple to use…and install. Yet, Guardian Security reviews still seem to indicate customer are experiencing issues. That is why so many homeowners are electing to set up their own DIY alarms. The more experienced do-it-yourself alarm providers have actually drastically streamlined the set up program to be able to make it simple for even the most technically challenged individuals. The better companies pre-program the entire system prior to mailing it out, so that all the end user has got to do is mount the equipment and then get in touch with to have the system turned on. In excess of 90% of homeowners observed our best DIY wireless house alarms systems simple to set up! • Less Time and effort . In the event you select professional installation, you may want to consider an alternative company such as ADT Home Security. If not, make sure that you find out how skilled your Guardian Security tech is and whether they have been background checked and also are undergone drug screening process. Ask whether or not the company has their own employees or just utilizes Third party subcontractors. Using subcontractors isn’t always bad (they can even possess more expertise when compared with company personnel) nonetheless be sure they should have actually completed thorough screening before letting them into your your home. Is Guardian Security relatively easy to operate? Guardian Home Security has advanced significantly in the last few years. Consequently, experts claim Guardian Alarm places a substantial amount of emphasis on simplifying the user interface. Long gone will be the complex combination of codes on archaic push button control panels on Guardian Protection Services. Guardian Protection utilizes modern touchscreen display user interfaces which you’ll find intuitive and prompt the end user through tasks like for example arming, disarming, bypassing particular zones etc.. Guardian Security Reviews praise the completely automated interactive smart phone apps equipped with home automation capabilities which permit you to supervise your dwelling from anywhere on the planet utilizing computer access. Several systems are even integrating speech control capability via their own products, Google Home or Alexa. This let you perform common functions simply by providing some sort of voice instructions. Expect Guardian Security to offer comparable services. Though you may find Guardian Security reviews might point to horror stories about installations, customer service or even billing issues, you’ll seldom see Guardian Alarm Reviews which complain that the a Guardian Alarm is tough manage. How Much Time Will It Require Guardian Protection Services to Respond to a break-in? Though nearly every provider promises to feature the quickest reaction time in the industry, it is important that Guardian Security reviews give you some idea how to interpret all of these claims. Guardian Home Security systems often make use of a 30-60 second entry delay on your main entrance to be able to permit you a chance to disarm the system. The Guardian Alarm system can typically be placed on “Instant” function whenever everyone is home. The alarm will go off right after whatever delay in case the system is not disarmed. The Guardian Protection monitoring center reaction times are usually determined from the time an alert is acquired to the point in time the dispatcher calls your home to confirm the signal. This period really really need to turn out to be within a 60 seconds. In the event that no one picks up at the household,Guardian Protection Services operators will endeavor to get hold of everyone on the emergency contact list …and they then dispatch the police. Although you may find Guardian security reviews which report higher reaction times, the vast majority of the best security alarm providers actually do a top notch job – so long as things are working properly. Guardian Protection Services recommends that your chosen alarm is tested on a once a week or at least monthly basis to make certain the system as well as communications are unquestionably operating effectively. Nationwide, the normal reaction time frame by the authorities is roughly 7 minutes, but, this could possibly vary greatly. In the event you already have Guardian Home Security and can provide observations on their real-world reaction times of Guardian Protection Services, we hope that you will take the time to mention your experience in our customer Guardian Security reviews. At the end of the day, even if you purchase a security system from Guardian Protection Services, following these common sense home security tips will help reduce the chances of becoming the victim of a break in. In our Guardian Security reviews, we want to share some easy steps you can take to better safeguard your house from burglars. 1. Eliminate hiding spots by continuing to keep bushes cut near entryways as well as low lying windows. 2. Make sure that the outside is well illuminated. Motion activated floodlights are an affordable deterrent. 3. Make the home appearance inhabited. Put lights and electronic devices on random timers to give the illusion that somebody is in the house. Have a next-door neighbor park their vehicle in your driveway. 4. If you are going on holiday, suspend paper and mail shipment, and make strategies to have the yard cut. 5. Ensure expensive products are not noticeable from the outdoors by drawing the blinds. Acquire a professionally monitored alarm. You will sleep much better understanding your home or business is secured. Once you have checked out online Guardian Security reviews, you get a quote from Guardian Security and then see how it compares with Guardian Protection Services top competitors. Thank you for visiting! Please feel free to share our Guardian Security Reviews , below or follow us, above. If you or someone you know has experience with Guardian Security or a a Guardian Security System, we hope you will share that experience in our Customer Reviews.